Khiem Dinh is an engineer for Honeywell Turbo Technologies at the time of this writing. All statements and opinions expressed by Khiem Dinh are solely those of Khiem Dinh and not reflective of Honeywell Turbo Technologies. 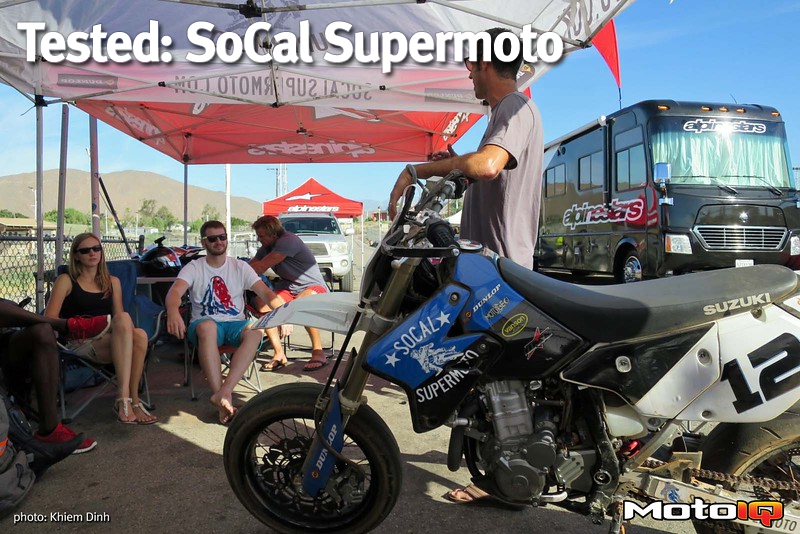 Brian Murray operates his Socal Supermoto school at Adams Motorsports Park in Riverside, CA. 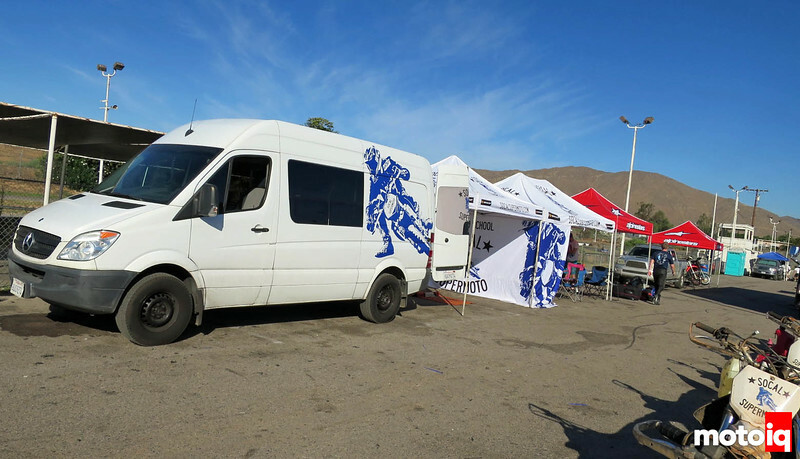 For a little bit more than a couple Benjamins, you get more track time then you’ll know what to do with, bikes provided, some grub, pictures, and a really high quality athletic t-shirt. You just need to show up with your own gear. In other words, it’s amazing bang for the buck! Oh, and you’ll be a better rider when you’re done! So you guys probably know I ride road bicycles and also sport bikes. But I actually started out playing in the dirt more often than not. I started riding a bicycle when I was four around the neighborhood and on the dirt trails cutting through peoples’ yards. I got a mountain bike in high school and hit up the single tracks here and there in high school and college. I started riding motorcycles about 13 years ago and all that experience has been of the sport bike kind. 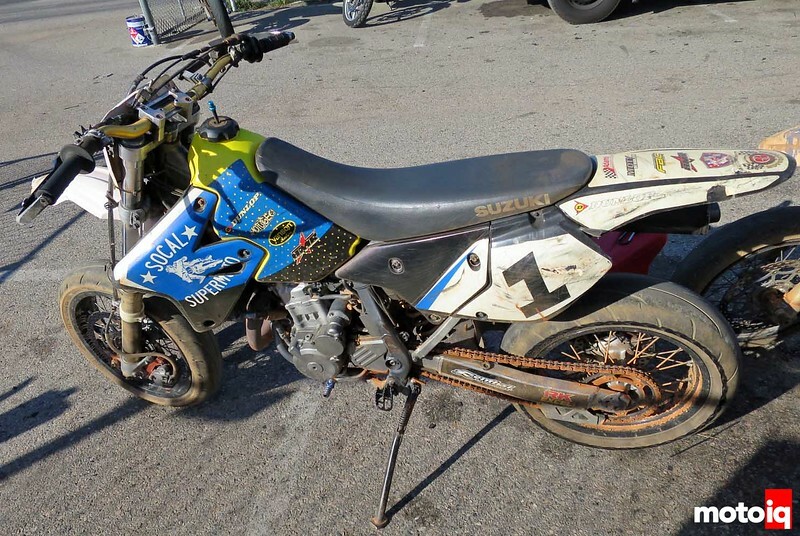 So as far as motorcycles go a supermoto bike was relatively foreign. However, I was hoping my old mountain bike experience would come in handy. This is basecamp where all the magic happens. The fleet of bikes for the class are lined up and fueled. A supermoto bike is pretty simple. 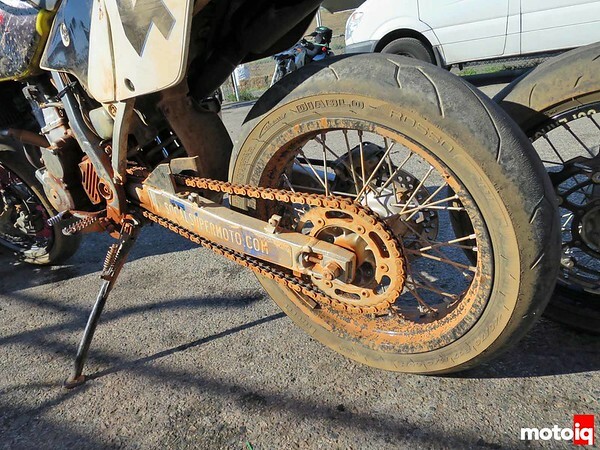 You basically take a 4-stroke dirt bike and put on sticky street tires on 17” wheels with bigger brakes. 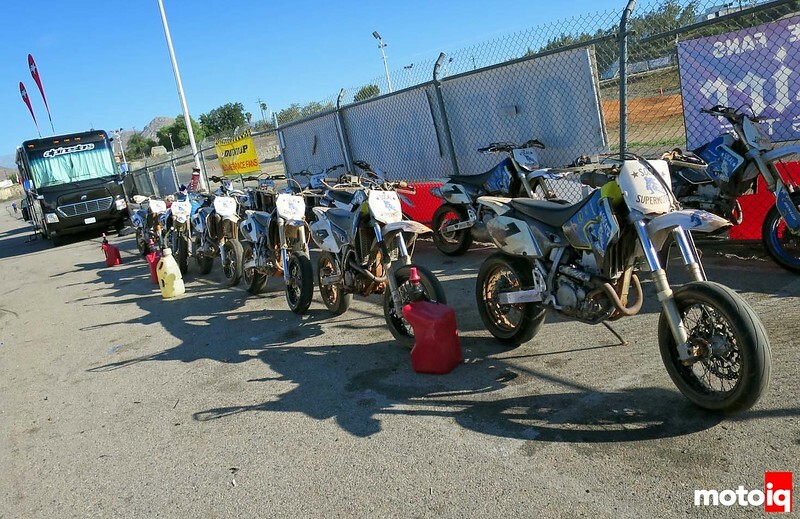 The bikes for the class are Suzuki DR-Z400s with, you guessed it, 400cc engines. The tires are basically sport bike tires, so at least one thing was familiar. The front brake rotor is massive compared to a typical dirt bike rotor. Yup, the brake size is good for handling the higher braking power demands on asphalt compared to dirt. 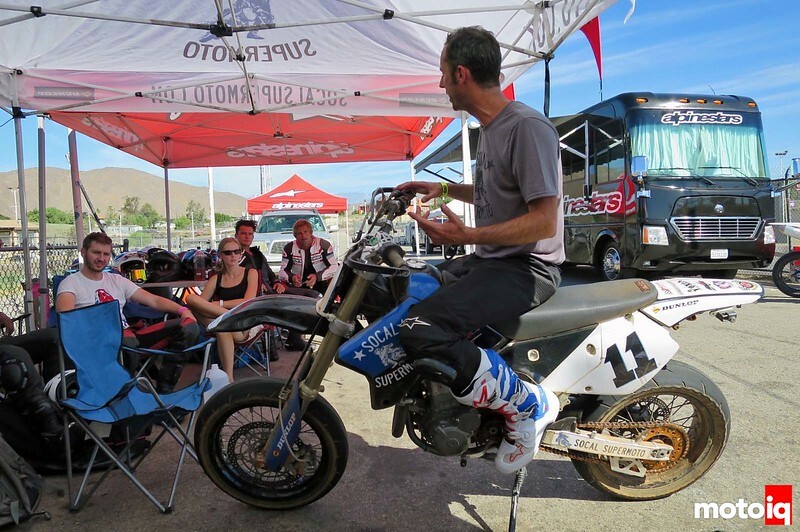 The class before the first session is just a basic introduction to a supermoto bike. The riding style is drastically different than riding a sport bike. Brian said the dirt bike guys would be fine, except they’d need to learn to use more front brake. As for us sport bike guys, we were screwed. This is where I was hoping some of my mountain bike experience would come in handy. Oh yeah, being Los Angeles, you run into famous people. The two guys sitting in back are surf legend extraordinaire Laird Hamilton (one of the guys credited with inventing tow-in surfing) and his ocean going friend Pirate Will Turner, er, Orlando Bloom. Just some other random Hollywood/motorcycle trivia, Brad Pitt is big into bikes and is co-producing a film about MotoGP. Matt Leblanc is a huge Aprilia fan and will get the first of a model imported to the US (he’s a big Porsche fan too). Keanu Reeves did the Socal Superbike School a few weeks earlier. Christian Bale can be spotted at motorcycle track days. And that guy Tom Cruise knows a thing or two about sport bikes.